And by there, I was talking about Kye and Eric’s huge backyard, which just so happened to be covered with three feet of snow. So Eric being the awesome guy that he is, grabbed the snowblower without hesitation and started clearing a path. And clear he did, all the way down to the grass, creating a perfect walkway out into the yard and it’s beautiful scenery. Jared and I covered up in our snow pants and boots and out the back door we went! Kye and Eric have been engaged for a little over a year now and Kye, being on top of her game like she is, had her dream wedding plans complete within one month of their engagement! Craziness I tell you! 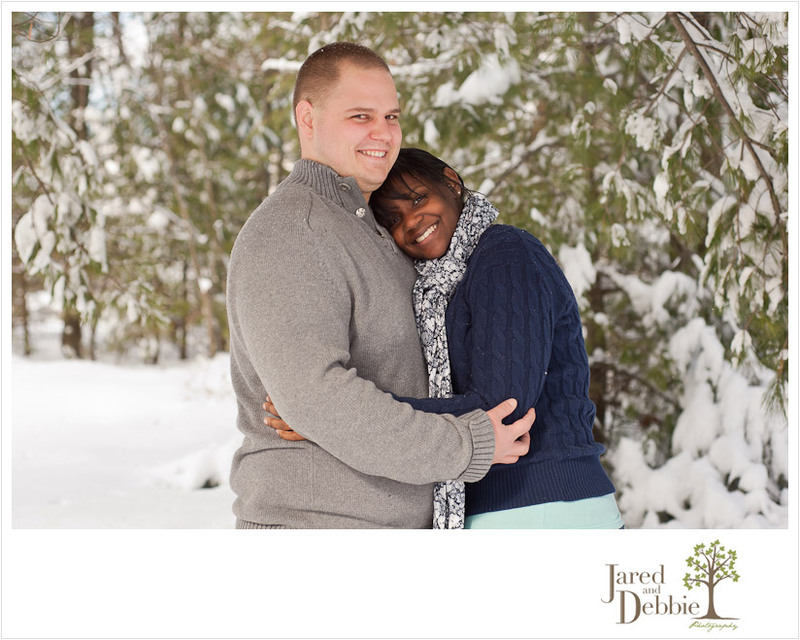 Their big day is this coming July and Jared and I are so excited to capture it for them! Be prepared for image overload! There were just too many favorites from this session! And a perfect ending to a perfect session!! Kye and Eric we cannot thank you enough for being so willing to go along with our crazy ideas! Now who says you can’t do a shoot in the snow?!? Not us!